Deborah addresses your specific issues and then works with you on practical techniques and exercises using a song you have brought in. The results are almost immediate. Deborah has performed and taught successfully in all styles – from classical to pop, musical theater, and rock – and into the recording studio. 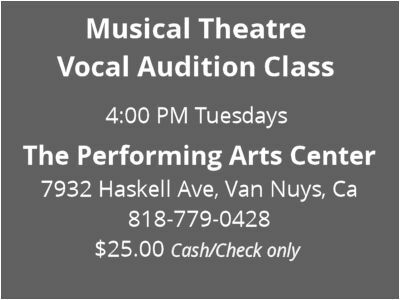 She has been a voice teacher and vocal coach in both New York and Los Angeles, serving on the faculty of the Musical Theatre Workshop of the Los Angeles Civic Light Opera at the Music Center and the American Center for Musical Theatre in Hollywood. Deborah is currently teaching musical theater vocal classes, technique and song interpretation at The Performing Arts Center, where she works with young dancers as part of their professional training program, and The East West Players Actor’s Conservatory Program, which offers a comprehensive theater arts curriculum for actors who want to hone their professional skills. Lessons are $150.00 per hour. Call or text Deborah at 818-414-1691, or send Deborah a message.